Contact Jon Young, or phone +44 (0)1874 713068. LibraryLink uses a database to provide comprehensive digital image and document management functionality. This allows LibraryLink users to keep track of digital files by cataloguing them with a thumbnail and additional metadata (such as title, annotation, copyright, keywords, etc.). Once files have been catalogued LibraryLink makes it easy to associate them with database and GIS records. LibraryLink displays any files that have previously been associated with the database/GIS record and allows the user to add or remove links to other files. This can be done by simply dragging files between panels to add or remove them. 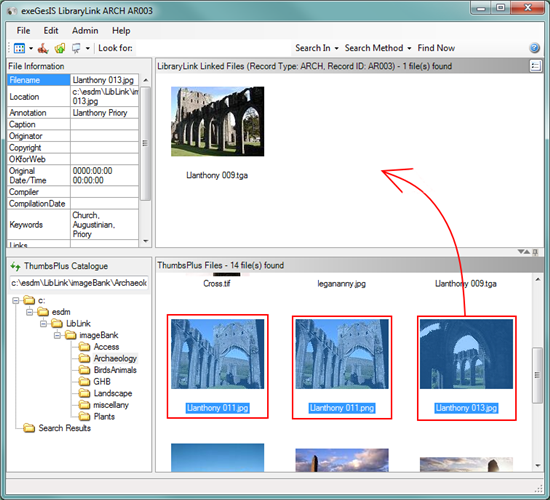 LibraryLink provides a fast searching functionality to find files in the catalogue. The matching results can then be linked to the current record. Files can be quickly opened by double-clicking on the thumbnail from within LibraryLink. LibraryLink can also be supplied as a "Developer Kit" which allows integration into any application (database or GIS) or we can do this configuration work for you.